Photo by Mitchell Gunn/ESPA Mikaela Shiffrin of the U.S. Ski Team reacts in the finish area after competing in the Audi FIS Alpine Ski World Cup giant slalom Race at Semmering, Austria Dec. 28. She finished eighth, her best GS result this season, then DNFd the slalom the next day. But Shiffrin has been terrific in the New Year, winning twice in Croatia and Austria. She spent the day doing high school homework, then 17-year-old Mikaela Shiffrin of Eagle-Vail, Colo. went out and won her third World Cup slalom of the Audi FIS Alpine World Cup season in Austria Tuesday night. The stunning victory drew immediate comparisons between Shiffrin and Austrian great Annamarie Moser-Proell, who won her third World Cup race at exactly the same age—to the day. Moser-Proell would go on to win an women's World Cup record 62 races over the course of her 11-year career. Moser-Proell also earned the third World Cup win of her career at 17 years, 308 days old, same as Shiffrin. Shiffrin, voted World Cup Rookie of the Year last season by her peers, poured on speed throughout her final run in the night slalom at Flachau to extend her lead in the discipline to 81 points over World Cup overall leader Tina Maze, 28, of Slovenia. Shiffrin has 436 slalom points, Maze 355. First-run leader Maria Hoefl-Riesch of Germany went out and Maze of finished fifth as Shiffrin captured her second straight slalom victory and third in six events this season. Her first win was Dec. 20 at Are, Sweden. Shiffrin’s victory Tuesday was by .85 seconds over Swede Frida Hansdotter finished second. Earning third place was Tanja Poutianen, 32, of Finland, the oldest racer on the women's tour. The victory featured the largest purse on the women's World Cup, earning Shiffrin just over $58,500. Shiffrin said, “What else does a 17-year-old have to do with this much money? I could buy a car but I’m not allowed to drive yet. I’m really close to graduating high school, so I guess I’ll use it to pay for college. “My secret is to not let anything stop me. Sometimes the crowd gets into your head and all of a sudden you’re nervous but instead I just let them take me to the finish. “Apparently my mark is the bottom of the course and not the top. You know how when three or four year olds run around all day and they just don't get tired. That's kind of like me, so at the end of the course, I'm like a three-year-old and I just keep going. I guess it works. Maze extended her huge overall point total to 1,334 points. Last winter, Maze amassed 1,402 points for the entire season to place second to American and four-time World Cup overall queen Lindsey Vonn (1,980). 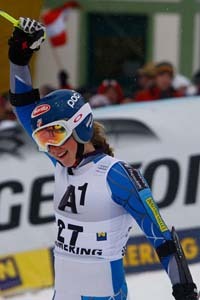 Shiffrin had just 168 points in the overall during her rookie season of 2011-12. Germany’s Hoefl-Riesch is currently second with 744 and Austria’s Kathrin Zettel stayed in third place with 597. Shiffrin (526 points) moved past teammate Vonn (504) into fifth place in the overall standings. Austria’s Marcel Hirscher leads the men’s overall standings 855-729 over Aksel Lund Svindal of Norway. U.S. technical star Ted Ligety is in third place with 676 points. Ligety’s lead in the GS standings over Hirscher is now 125 points, a margin of 460-335. Coming up: The men’s tour visits nearby Wengen, Switz. for the annual Lauberhorn weekend Friday through Sunday, Jan. 18-20 with super combined, downhill and slalom. The women are in Cortina di Ampezzo, Italy Jan. 19-20 for downhill and super giant slalom events. In a strategic decision to ensure a completely healthy run for a historic fifth Olympic Winter Games, Bode Miller of Franconia, N.H. has opted to utilize an injury exemption and sit out the 2013 Audi FIS Alpine World Cup season including the upcoming World Ski Championships, the U.S. Ski Team announced Jan. 16 from San Diego, Ca. The 35-year-old Olympic gold medalist underwent knee surgery last spring and when fully recovered expects his knee to be stronger than it has been in the last 10 years. Miller holds the American men's record for World Cup victories at 33 and hadn't missed a World Cup season since his debut in 1997. He also owns the record for consecutive race starts at 136 between March 2002 and January 2006 and is the most decorated U.S. Olympic skier in history. Miller had started 15 straight World Cup seasons and holds the record for consecutive race starts at 136 (March 2002-January 2006). He is a five-time Olympic medalist, four-time World Champion and has six World Cup titles. Miller holds the American men's record for World Cup victories at 33. He said, “It was tough for me to miss a season of ski racing, but this decision was easy for me when I look at my opportunity next year. My knee should be stronger than any time since before I injured it in 2001. This was a big year for me, getting married, and my wife being pregnant, so I’ve been able to enjoy that and extra time with my daughter. U.S. Alpine Head Coach Sasha Rearick said, “It is an incredibly smart and strategic decision by Bode. He has become legendary for pushing the limits of what is possible on skis, but he knows an additional injury to his knee could put the 2014 Olympics in jeopardy.